While Tunisia seeks more aid and development assistance, China could benefit from Tunisia’s strategic location. China’s inroads into North Africa have been under increased scrutiny in recent years, yet its relationship with Tunisia has gone largely unreported. However, since the establishment of diplomatic relations on January 10, 1964, the partnership between Beijing and Tunis has been expanding steadily. The two countries signed their first trade deal in 1958, making Tunisia one of the first Arab countries to establish trade ties with the Chinese. Since then a number of trade agreements have been signed by both Beijing and Tunis. To facilitate their growing economic relations, the Sino-Tunisian Joint Committee of Economic, Trade, and Technological Cooperation was founded in 1983. Several conferences, such as the China-Tunisia Cooperation Forum and the Tunisia-China Investment and Trade Forum, have been held to review the efforts made by the two countries to strengthen bilateral relations. Trade volume between the two countries has increased in the past few years. Tunis mainly exports phosphate fertilizers, while importing tea and light industrial products. Interestingly, although there are only a handful of Chinese enterprises operating in Tunisia, since 1984 there has been a significant presence of Chinese labor in Tunisia, working in different sectors including manufacture, light industry, and agriculture. As in many countries in North Africa, Beijing’s footprint in Tunisia is most pronounced in the development and construction sectors. 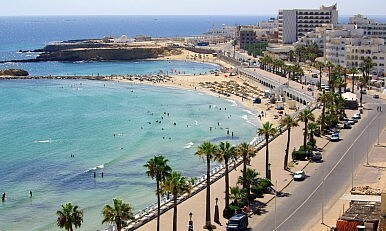 Last year for example, China reportedly inked an agreement to build a university hospital in the coastal city of Sfax. In addition to its $1.8 million donation to Tunisia’s health sector, the government in Beijing also sent several doctors to work at the hospital. It was reported that China has been sending medical teams to Tunisia since 1973. China has also signed two other agreements, including developing lighting at marinas through the installation of solar panels along Tunisian ports, as well as setting up shrimp farms in the Tunisian Mediterranean Sea. At the same time, Tunisia has also started to make some investments in China. For example, a chemical fertilizer joint venture was established by Tunisia and China and today it has become a leading compound fertilizer in China. Their partnership in the field of development will likely expand in the coming years. As indicated by the Tunisian industry minister last year, Tunisia is currently seeking to speed up its economic development and therefore there will be major infrastructure projects in the coming years. Early this year, Chinese Deputy Foreign Minister Zhang Ming publicly made clear China’s readiness to boost its partnership with Tunisia in the field of development projects. Despite going relatively unreported, China’s ties with Tunisia have expanded into multiple fronts. China has sent several delegations to participate in Tunisian cultural activities including art festivals and film weeks. Since 1976, students from Tunisia have traveled to Beijing to study. Other exchanges are taking place in the realms of naval exchange, transportation, tourism and telecommunications. Progress has also been made in the military and security fields. Last year, the two countries reportedly signed a $4.8 million Chinese grant to Tunisia. The deal includes military procurements for Tunisia’s National Army. As indicated by the Tunisian defense minister during the signing ceremony, there is a scope for strengthening China-Tunisia military and strategic cooperation. As the bilateral cooperation between China and Tunisia is expected to continue to flourish in the coming years, the two countries have begun to acknowledge the significance of air connectivity. This month for instance, an air transport memorandum of understanding (MoU) was inked by China and Tunisia to allow a Tunisian airline to secure 21 direct flights a week to China. Alongside trade and investment, Beijing-Tunis relations have been strengthened by Chinese aid. From 2000 to 2012, China provided 214 million dinars ($127 million) to Tunisia in loans and 54 million dinars in aids. In 2011, for example, China gave $2 million in aid for refugees on the Tunisian-Libyan border. The most recent example of this was in December last year, when China donated 37 million dinars to be invested in development projects in Tunisia. There is also the possibility of a growing partnership in the field of renewable energy. It was reported by the Africa Economic Development Institute that although Europe and the U.S. continue to dominate Tunisia’s energy sector, companies from China have recently begun to make inroads into this market. As Tunisia seeks to expand its renewable energy sources, this would offer Beijing an opportunity to strengthen its foothold in Tunisia. As the Middle East and North Africa grow in importance to Beijing, China looks likely to exert more effort in strengthening its ties with Tunisia. Even though Tunisia has fewer energy resources compared to other countries in the region, it does provide Beijing with an opportunity to widen the consumer market for its exports. At the same time, given Tunisia’s geographic position, it could potentially serve as a hub for political and economic expansion in the wider North African region, particularly Libya and Algeria. Meanwhile, for the Tunisia, strong ties with China will not only offer it access to much-needed foreign investment capital and technology, but also indispensable aid and assistance, which China has increasingly offered in the past several years. Muhammad Zulfikar Rakhmat has lived in the Middle East for seven years. He holds a B.A. in International Affairs from Qatar University and is currently a research assistant at the same university.